Creamy White Christmas Coconut Margarita Punch recipe for a crowd is so festive and will be a huge hit for any holiday party. It is truly Christmas in a glass! 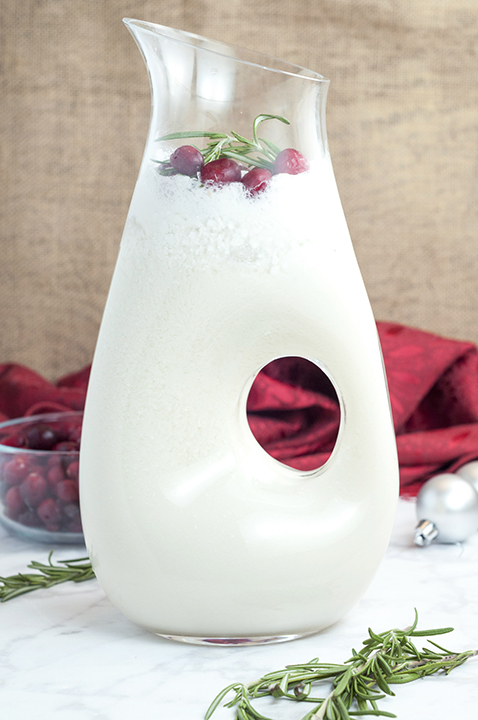 “I’m dreaming of a White Christmas….in a glass”. Is that a song? Well, I just made one up. Before you decide what drinks you’re serving at those holiday parties this month, look no further! 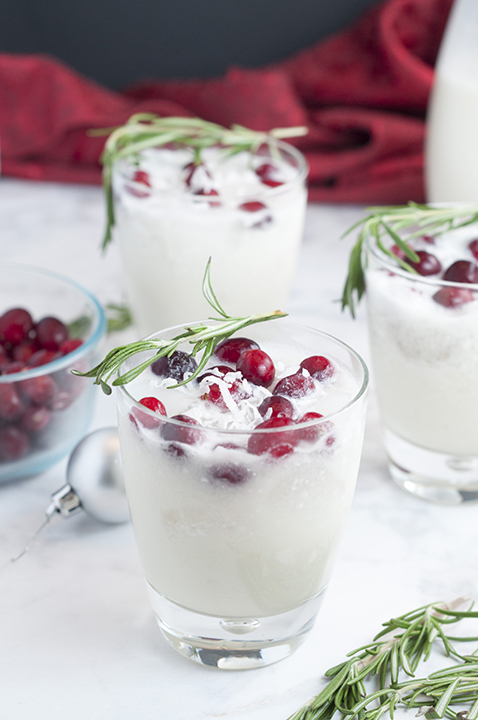 This White Christmas Coconut Margarita Punch is the stuff that Christmas dreams are made of. Not everyone loves eggnog so time to serve something different for the festivities! Do you have all of your plans made for your Christmas menu this year? 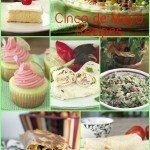 If not, I highly recommend adding one more fun recipe to your list. RUN to the store and get all of the ingredients for this punch now! Your holiday guests will thank you. I do admit that I love all things Christmas and am borderline obsessed with anything festive this time of the year. I just feel there is nothing NOT to love about this drink. Look how pretty and “clean” it looks! Like fresh fallen snow poured into glasses. OK, I’m a huge dork – I realize this. This White Christmas Coconut Margarita Punch also kind of incorporates my favorite summer drink: the Piña Colada. 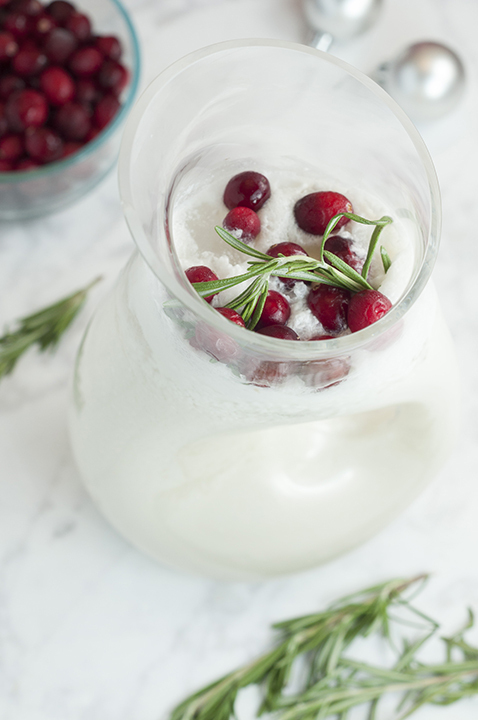 It is loaded with coconut flavor, fresh lime, but has the addition of cranberry to make it seasonal for the holidays. Simply irresistible. The garnishes are optional but make such a beautiful presentation. Even the shredded coconut looks like snow on top! I even included a tip in the recipe directions on how to make your own simple syrup. Below, I included some other holiday party punch ideas if you’re not digging this one (which is probably nobody out there in their right mind) or need another variety. Before pouring into the pitcher you will be serving the punch in, mix all ingredients together well in a bowl. Use a whisk to get out any lumps out of the coconut milk or coconut cream. Pour into serving pitcher and serve cold. 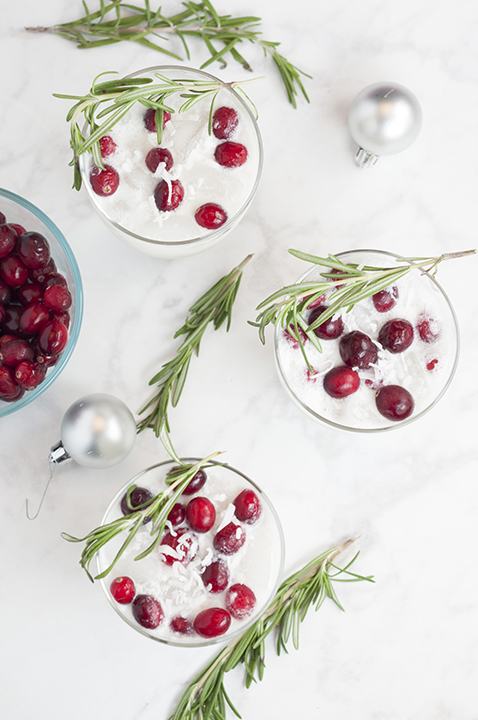 Pour in individual glasses filled with ice and garnish with rosemary and/or cranberries and shredded coconut, if desired. *Tip: to make the simple syrup, combined equal parts sugar and water (like 1 cup sugar, 1 cup water) in a saucepan over medium heat. Whisk constantly until the sugar dissolves and the mixture comes to a boil, then remove from heat and let cool completely. Oh delish. This sounds so festive and refreshing! 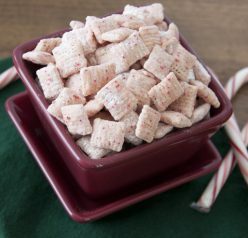 I might just add this to our Christmas brunch menu! What a pretty and festive punch! I swear that I don’t serve punch nearly enough. This recipe could get me to change that fact! Oh neat! 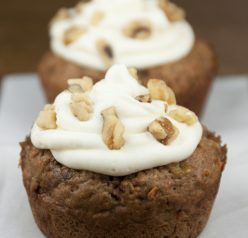 I love how white these are and that you used coconut milk! Those look gorgeous – so elegant and festive! This cocktail is so pretty and festive! 🙂 And love that it is coconut flavored- so unexpected during the holidays! This is gorgeous! What a perfect Christmas punch. So pretty, pinning this asap! Now THIS is a gorgeous drink! Love all that coconut!